For anyone who has read more than one article on this blog, it's pretty clear I harbour a passion for gadgets and technology. I'm pleased to be a go-to guy for family, friends and colleagues and love helping them research, purchase and enjoy smartphones, tablets, laptops and all other manner of shiny goodness. But there is a technology I have a hard time with and unfortunately it's a bit of a key one. Yes, choosing a television has become a real minefield. The most recent case was my Dad, who, after (really) agonising over parting with a perfectly okay Hitachi "box" TV in his living room, was ready to go to the land of the HDTV. Little did he know the pain was just beginning. The brief was a small 32" with enough 'smart' functionality to nicely integrate all the catchup TV services, as well as offer the all-you-can-eat movies and TV from NetFlix and LoveFilm. Now if your budget is £4000 and you want a monster TV that will require your whole house being reinforced before you can mount it, then there are plenty of experts out there lining up to tell you how good it is, with maybe only a nod of acknowledgement toward the terrifying price-tag. But what of those of us with more modest budgets and requirements? My poor Dad found that beyond Amazon reviews, there is very little to go on out there on the internet and far too much misinformation. For example, many TVs were described as being 1080p, implying that they had the higher specification HD picture resolution. Too many times, a bit of digging turned up the truth, that although those TVs would accept this signal, the screen was actually of the 720p variety. Not necessarily bad, but clearly the seller didn't know what he was talking about (and being retired, my Dad took the time to tell them!). The reason we settled on the LG 32LN575V (catchy name) was that it had met the technical brief (although information on the smart functions was sparse) and it did well in the few write-ups we could find, with the only real concern being the sound quality. More on that in a bit. At this end of the market, a lot of televisions tend to look more like a functional computer monitor than something that needs to look nice in your living room. Whilst being an excercise in glossy plastic, the LG is smart and appears to float above its stand from certain angles. It looks more expensive than it is. As well as not rushing the design, LG has provided plenty of connectivity for all the set-top-boxes, games consoles and the like that people want to be able to plug in. These are available down the left hand side, hidden behind the screen, so wires should stay out of sight, without making it too difficult to swap things over when necessary. 3 HDMI sockets is plenty for most to be able to connect up their gadgets and one doubles as an MHL link, which is a method of playing back content from moble devices like smartphones. There are also 3 USB connections here, one which will support an external hard drive, which we'll talk about in the 'Hidden Tricks' section. 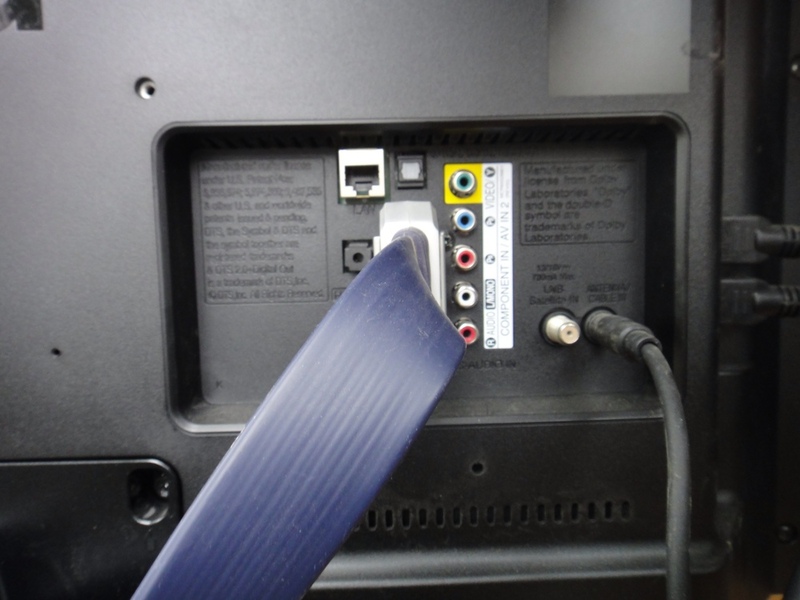 Round the back, if you insist on holding onto some older gadgets, you'll find a SCART connection, component inputs, a 3.5mm headphone jack and the optical for digitally connecting to a sound system. The 575 also has WIFI onboard, but for those TVs situated too far from a good signal, a network (ethernet) socket is also on the back for the best possible connection for those internet based services. It's a strong list of connections that not every TV at the price will offer. When it comes to looking at TV performance at a scientific level, measuring the colour gamut, gamma and so on, I don't have the tools or the knowhow (check out HDTVtest.co.uk). I can tell you with confidence that the picture on this TV is impressive. There is a FreeView HD tuner on board and whilst testing, we watched some of the Formula 1, which, with its fast moving pictures and atmosphere made a good challenge for the 575 to make a good impression on us. With its 1080p screen, LED backlighting and quality picture processing, the racing looked great, even during fast camera pans, the focus stayed sharp and the motion smooth. Whilst modern stuff on HD channels looked the business, the non-HD picture was slightly softer and very old movies suffered a bit from being over-processed by the TV resulting in some strange effects like eyes subtly moving position on people's faces. If it were my TV, I would be tempted to dial back a lot of the picture noise and motion control, or switch it off all together. Fortunately this can be done, and the settings menu was relatively user friendly. It was also nice to note that you can set picture preferences (brightness, contrast etc) for each of your sources individually, making sure you get the best out of each one. Whilst the picture was good enough to make me want to upgrade my aging Sony 40" LCD, the same could not be said for the sound. Whilst it was detailed and voices were nice and clear, there is no bass at all and so some of the immersion of a sports event or action movie will definitely be lost, although you probably won't notice during an episode of Eastenders. This is a limitation of pretty much all HDTVs at this size, since there simply isn't the room to pack in the kind of speaker units to get the lower frequencies out. In the kitchen or bedroom, this would be fine, but budget for an external sound source if this is to be your main TV. If space is an issue, soundbars have come on leaps and bounds recently and were made for these screens. In fact the LG incudes HDMI Arc, which, with a compatible soundbar would integrate the volume control into your TV remote, so it's a pretty tidy solution. The Freeview HD tuner is definitely a reason to choose the LG over some of its competitors, which still come with only a standard definition offering. Some might say you can't get the benefit of HD on these smaller screens, but I would strongly disagree. It was visibly sharper, especially if you sit close. Of course, live television has a lot to compete with these days, not just DVDs and games consoles. More and more of us are ignoring the schedules and watching programmes when we want to using the various catch up services and smart-TVs like the 575 are there to deliver. 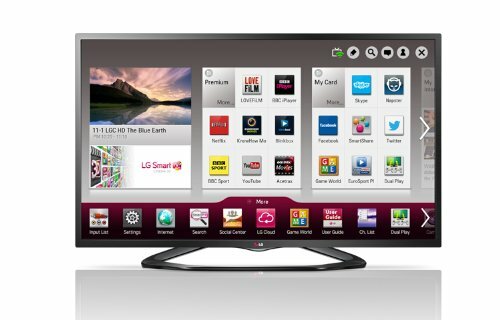 Smart-TVs are rather like smartphones in that they offer 'apps' that extend the functionality of the device. They've not been quite so successful on TVs as they were phones, but largely because TV makers didn't reimagine the idea, they just copied it and most of what they offer is pretty disappointing. In LG's case, the smart platform is actually pretty good, but I imagine most of what is there you won't ever use, except maybe the video services, which we'll focus on here. Amazingly, we weren't able to find a single TV that had all the UK catchup services on board. LG are no better in that only the BBC iPlayer and Demand 5 are present. No ITV Player or 4OD, which is a shame (well, maybe not ITV!). The good news is that the smart TV menu is fast and responsive and the picture quality very good, especially the iPlayer with HD switched on. We had no trouble streaming over WIFI either with no buffering once the show got going (broadband getting about 6MB in speedtests). When it comes to services that cost money, manufacturers seem much more willing to pull their finger out and there is a good compliment of paid for video services here, from the excellent value Netflix and LoveFilm to NowTV from Sky and BlinkBox, a movie purchase and rental service owned by Tesco. I didn't have accounts with all of them to test, but Netflix worked well, although picture quality was not quite a match for the same app running on a Playstation 3. Youtube deserves a special mention, as this is a great example of an internet service that I've always wanted easy access to from a television and this app makes it happen. Navigation and picture quality are excellent, although navigation using the remote can start to get a bit painful when you're browsing around looking for something good. Decent smartphone owners rejoice however, as you can control Youtube from your smartphone Youtube app and a phone's touchscreen makes for an excellent way to trawl through all those millions of cat videos. So far we've learned that the LG has a great picture, disappointing sound and a decent smart setup that would be even better if it weren't missing a few key catch up TV services. It's already a device I will be recommending to friends, particularly at the prices you can achieve at Richer Sounds and Amazon. It turns out though, that LG isn't done with the treats and there are a few extra features worthy of mention that help this TV standout from the crowd. These days, TV broadcasters are aware of the threat known as the second screen. Apparently, after a brief dip, we're all starting to gather round the big screen as families again. Trouble is, we're not looking at it very often, as we're distracted by our tablets and smartphones. Whilst they are definitely a better way to browse the internet, if you don't have or care for these additional devices, I found the internet browser on the LG to be surprisingly okay. It even supported embedded video on some (not all) sites like the BBC news and you could still watch TV via a picture-in-picture mode. It's not for everyone, but it's there. Remember those USB sockets I mentioned earlier? Well, they're not just there to let you look at photos from a USB stick (although it will do that quite happily). You can also connect up a USB memory stick and use the onboard software to pause and rewind live television and schedule recordings via the excellent electronic-programme-guide (EPG). My Dad actually contacted me for help over this function however as it wouldn't work with any of his vast collection of USB sticks. A spot of Google searching later, we discovered you have to have a minimum 40GB free on the stick, which means buying a 64GB version. These are about £20 upwards now, or a pocket hard-drive will do the same thing (less neatly in terms of boxes) from about £40. We tried with the latter and it worked beautifully, offering two record quality levels (original and standard) allowing you to get the most out of the available space as you need. It's not so very long ago that the flatscreen TV plummeted in price. This TV hands down beats anything that was around when I bought my TV back in 2008 at many times the price and offers a lot more functions beyond just a better picture. At about £300, it's a very complete package, offering full HD, WIFI to connect to the internet and enough 'smart' features to ensure there's always something good to watch. Sound is on a par with anything else of the same size, but if you watch the sports or like to be immersed into your movies, I recommend the next thing you save up for is an upgrade for the sound for some bass action. If I can talk Dad into investing in a soundbar, I'll have a review for you soon! Otherwise, the LG 32LN575V comes recommended.